If you’re looking for a high quality professional carpet and upholstery cleaning service in Gloucester then we’re the answer! Ecoclean is a local and trusted family owned business that prides itself in giving you exactly what you want to guarantee 100% customer satisfaction. 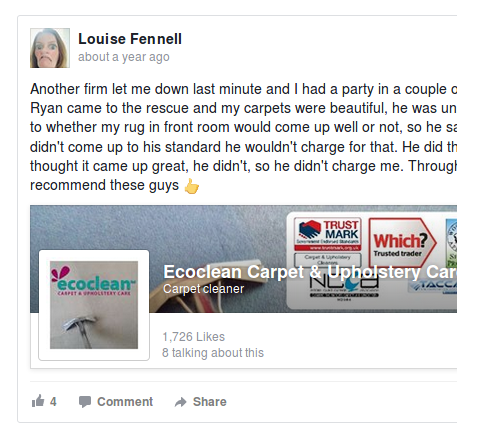 Ecoclean, the carpet cleaner of Gloucester! We come highly recommended by a huge number of local customers as you can see from our testimonials. We’re fully trained to iicrc standards, members of the National Carpet Cleaners Association, The Approved Carpet Cleaners Association and are Woolsafe approved service providers We’re also fully insured which ensures your carpets and upholstery are safe in our experienced hands. There are many types of carpet that use varying fibres and construction, our training and experience means that we will know all about your carpet and use the correct method to leave it deep down clean removing all dirt, soil, grease, pollen, tar and allergens including dust mite faeces (which is medically recognised as a major cause of asthma) and leaving you with soft, fluffy, fresh odour free carpets. Our solutions are child, pet and expectant mother friendly and completely bio degradable. You don’t need to worry about moving heavy furniture either, we move and replace everything to give you the most thorough clean possible. Professional cleaning on a regular basis extends the life of your carpet, the dirt from every day use acts like sandpaper on the fibres every time you walk on it, and let’s face it, carpets aren’t cheap to replace. If you’re moving out of a rented property we understand that you want to get your deposit back, many letting agents specify a professional carpet clean and as an NCCA registered company we give you the best chance of doing just that. 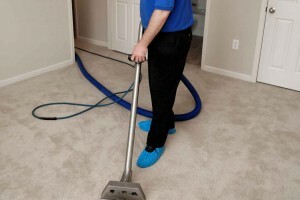 We offer discount end of tenancy cleaning if the house is empty and there is no furniture to move. Many agents also require flea treatment if you’ve had pets and as qualified and registered textile pest controllers we are able to provide this service using licenced products and providing you with proof it’s been professionally done. 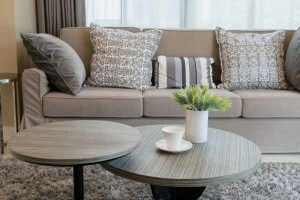 It’s not just carpet cleaning we offer, we are also qualified upholstery cleaning specialists and can restore your soft furnishings to their former glory whether it’s sofa cleaning, a three piece suite or even just a single chair.. There’s a lot more to upholstery cleaning that you would think which is why it pays to have an expert clean your expensive furnishings. We offer several methods with all of them providing rapid drying times, even our deep wet clean is followed by the use of fans to speed up the drying process. Accidents happen, it’s a fact of life, and when they do we can help. We use advanced stain treatment processes and a huge selection of specialist solutions to provide the best chance of removing that stain. We often tackle coffee stains, tea stains, red wine stains, paint spills, make up stains, wax stains and even more unusual ones with success. Once your carpet is thoroughly deep down clean you can help to protect it from those spills by choosing for us to apply a protectant. This prevents liquids sinking into the carpet fibres rapidly which means anything that ends up on the carpet is easier to remove. Our protector has the added bonus of killing dust mites.